Arsenal are reportedly plotting a summer approach to sign former Manchester United defender Jonny Evans from West Bromwich Albion. Arsenal have named Santi Cazorla in their squad for the knockout stage of the Europa League. The Spain international is currently recovering from a recurrent Achilles injury for which he underwent a 10th operation earlier this season. Germany international Mesut Ozil has reportedly prepared to pen a fresh three-year contract with Arsenal once he returns from the summer World Cup in Russia. Arsenal are reportedly prepared to offer Mathieu Debuchy as a makeweight to sign West Bromwich Albion defender Jonny Evans this month. The Gunners have underlined the need for a new centre-back, and there are presently leading the race to sign the ex-Manchester United graduate. West Bromwich Albion are prepared to sell Jonny Evans to Arsenal, provided they can get their hands on Calum Chambers in a straight-exchange deal. Arsenal begin their defence of the FA Cup with an away trip to Nottingham Forest in the third round. The Gunners come into the game on the back of a eight-match unbeaten run, though only three of those matches have resulted in victories. West Bromwich Albion have reportedly identified Arsenal defender Mathieu Debuchy as one of their prime targets for the transfer window. Arsenal defender Mathieu Debuchy has admitted that he could pursue a new challenge when the transfer window reopens in just over a week's time. Arsenal are at the Emirates Stadium for Tuesday's League Cup quarter-final versus West Ham United. The Gunners returned to winning ways with a 1-0 Premier League win over Newcastle United last weekend, and Arsene Wenger is certain to ring in the changes with his side hosting Liverpool in a crucial league encounter on Friday night. Arsenal manager Arsene Wenger is likely to ring in the changes when they host BATE Borisov in the final Europa League group game. The Gunners are already through to the last-32 of the competition, and the manager will be expected to play a second-string side as he has done for most of the initial phase. Arsenal will look to secure the top position in their Europa League group when they face off against FC Koln at the RheinEnergieStadion on Thursday. Arsenal host Red Star Belgrade in Thursday night's Europa League game at the Emirates Stadium. The Gunners are only one of two clubs including Lazio, with a 100 percent record in the competition, and Arsene Wenger will hope to cement his side's qualification to the last 32 with a win over Belgrade. Arsenal attacker Alexis Sanchez has spoken fondly about Alexandre Lacazette citing that he is an 'excellent player' to work with. Arsenal manager Arsene Wenger has confirmed that Mathieu Debuchy will make his Gunners comeback when they take on Red Star Belgrade in the Europa League on Thursday. Chile international Alexis Sanchez will represent Arsenal in this season's Europa League after being included in the squad for the group stage. Manchester City are set to make a late raid to secure the services of Arsenal forward Alexis Sanchez. The 28-year-old is clearly unsettled at the Emirates, and his performance in the 4-0 loss to Liverpool on Sunday was clearly not upto the mark. Arsenal boss Arsene Wenger has highlighted that he is not in the hunt for new signings following the disappointing 1-0 loss to Stoke City on Saturday. England international Calum Chambers could have a future under Arsene Wenger following his decision to offload Gabriel to Valencia earlier this week. Turkish champions Besiktas have reportedly joined the pursuit of out-of-favour Arsenal defender Mathieu Debuchy this summer. 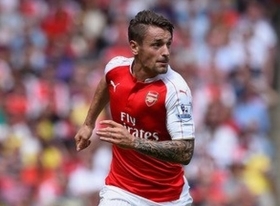 Marseille are reportedly keen on pursuing a Bosman move for Arsenal defender Mathieu Debuchy. The Frenchman has turned out just 23 times for the Gunners since arriving from Newcastle United in the summer of 2014.